A crown or most commonly referred to as a cap, is a type of dental product that is placed over a tooth to encapsulate it and protect it. Crowns can be used for a number of purposes to include restorative and cosmetic dental procedures. 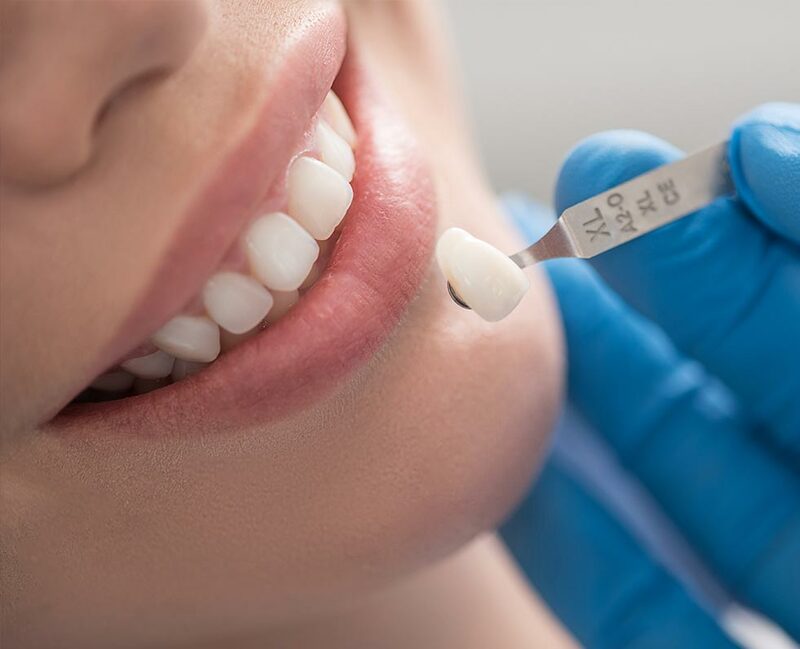 There are many different types of crown materials available to be used and the type used depends on your need for it and what one of our dentists here at Thornton Town Center Family Dental recommends. When you come into Thornton Town Center Family Dental, you can expect to learn more about crowns and how they can improve your smile. When it comes down to the basic crown we offer here in our Thornton, CO office, it is made from a porcelain that is fused to metal, which is abbreviated as PFM. A crown serves many different purposes and you will need one depending on your specific treatment plan. Below, we will take a look at the three main reasons for a crown. Crowns can be used for cosmetic reasons and to improve the look of your individual teeth. A crown in the cosmetic purpose is used to over up misaligned, broken, or stained teeth. Often times, patients will choose this option when they are unhappy with the way their teeth look. Crowns are color-matched to your natural tooth color too, so no one will ever know you had the procedure done. Crowns are also used for restorative purposes, specifically when a tooth is fractured or broken. Teeth that are damaged need additional protection and the crown can provide that for them. If a tooth is lost, a crown can be placed on top of an abutment or implant to provide a replacement tooth. Crowns are used to protect a tooth as well. The crown can be placed on a weakened tooth to ensure it does not break or fracture. Often times, when tooth decay is severe, a filling is placed on the crown to prevent more damage to it and add protection. What is the Process for Preparing My Tooth? Before you receive a crown in our office, you will need to have your tooth prepared. You may be worried that the process will be long and painful, but it is not as bad as you may have envisioned it to be. The process will begin with your tooth being shaped and this includes removing some of the enamel on the tooth itself. The part of your tooth left will be just the core or center of it. Sometimes, patients will have more tooth left than others as it just depends on how much decay is present or how badly affected the tooth is. Teeth that have a lot of enamel may need to be removed and others may not need as much. If you are worried about how much enamel is being removed, simply talk to one of our dentists, who will explain it to you. Once the tooth is shaped, an impression will be taken and sent to a lab to have the permanent crown made. When the permanent crown arrives, it will be placed onto your tooth. If you received a temporary crown, it will be removed at this time. One of the biggest concerns that patients have is whether or not the shaping process will hurt. It is not supposed to, and an anesthetic may be used to help keep pain or discomfort to a minimum. A crown is designed to last a long time and when taken care of properly, it will. Since crowns are made to be permanent, they are not supposed to simply fall out or need to be replaced. If you do not take care of your crown, you will find that they will break or come out. When the crown is placed on your tooth, you will be asked how it feels so that any adjustments can be made then. This will also prevent any damage to the tooth and crown, so it is important to let us know if the crown does not feel right in your mouth. If you happen to have a crown that becomes loose or falls out, we can replace it for you – just call us. Once a dental crown is in place, you may find that it feels quite awkward at first and it may take a few hours or days for you to get used to it. A dental crown will in no way limit your ability to chew or talk and should not cause you any issues. If you do find that the crown limits your ability to talk or chew, you need to come back into our office, as it may not be on the tooth properly. If you would like to learn more about dental crowns, now is the time to call Thornton Town Center Family Dental. Our dentists will educate you about them and determine if you need any to make your smile look and feel better.